The files can be protected by using a password. 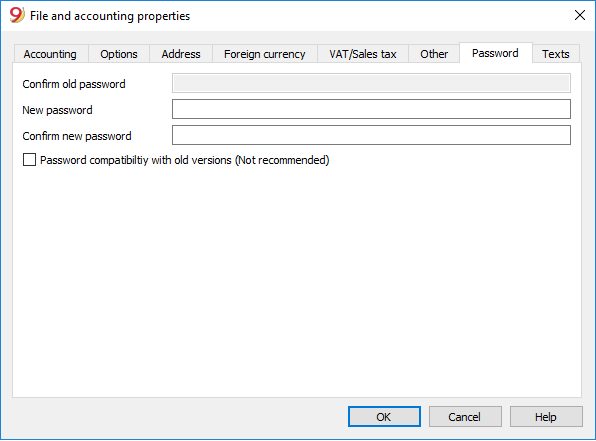 Activate this option if you want your password to be compatible with the Banana Accounting 8 versions and earlier. This option not recommended because the password is saved in a less secure mode. The box Confirm old password is shown in gray. Indicate your new password twice (New password and Confirm new password). Indicate your new password twice. Leave the boxes for the new password empty. For information about a forgotten password, please refer to the Questions and Answers page, Password unlock paragraph. Using a password does not give a high level of protection. In order to render the data truly inaccessible to third parties, it is necessary to have the appropriate cryptographic software.